Now easier than ever to get those books and pendulums that you've always wanted. Come on over and browse. A good source for many books in the MAG Bibliography - even many of the older/foreign publications. Cameron Aurameters Life Understanding FoundationP.O. Box 30305Santa Barbara, CA 93130(805) 649-5721http://www.dowsing.com/There probably still are other aura meters, but in my experience, they are not worth the money. Also, please understand that the vast majority of dowsers DO NOT NEED AND AURAMETER. They are too expensive, but for showing others the outlines of intangible targets, they are the best. Earth SymbolsAlex B. Champion, Ph. D., Owner.An earth symbol is a large walkable earthwork, with Sunken paths and elevated earth mounds. The designs are based on the archetypal patterns of Nature, and laid out using principles of sacred geometry, and geomancy. It is an earth sculpture, and a unique garden, as well as a spiritual symbol. It can be used for a personal spiritual pilgrimage, group ceremonies or walks. Or it can be used as place where people can gather to walk, talk, or have fun. A labyrinth naturally creates a sense of community. Alex Champion may be reached at (707) 895-3375, (707) 895-2598 (fax), PO Box 145, Philo, CA 95466 USA; or through email - Ask to receive his brochure and or his wife, Joan's "Voices of the Labyrinth" catalog. Check out his Earth Symbols website. Finger labyrinths are a wonderful way to get to gnow these ancient single path magical tools. "Walking" a lefthanded and a right handed labyrinth at the same time, does very interesting things to your brain. Walking a single one is relaxing, especially with the eyes closed. Due to their weight and import duties, it is by far the lease expensive to purchase these labyrinths in the country in which you live. In the United States - Paxworks - Hardwood labyrinths all good Chartres type. 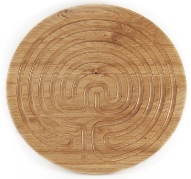 Relax 4 Life - Neal Harris has a full range of finger labyrinths. Pilgrim Paths - Barbara Wallace offers a wide range of wooden and cloth labyrinths. The one pictured is carved in the UK and is made of oak. In the Netherlands - at De Schaapshoeve in Schaapsdijkweg 20a, 5453 SE Langenboom. They are all made of beech wood and all have 12mm fingerpaths. Labyrinth Enterprises - Robert Ferre's web site. Robert makes the most accurate mass produced Canvas Chartres type labyrinths in the USA. Good how to books. Labyrinth making kits. This is a good one. Andrew Wiggins makes canvas labyrinths to order. He is the only canvas labyrinth maker I know of in Great Britain. In general in you live in the US a good place to look for Geomantic books is EastWest.com in California. British Society of Dowsers - An excellent collection of dowsing tools and books. You can contact them at: BSD, 2 St Ann's Road, Malvern, Worcestershire. WR14 4RG, UK. Tel & Fax: +44 (0)1684 576969. Caerdroia, The Journal of Caerdroia, the mazes and labyrinths research group. For subscriptions write: Caerdroia, 53 Thundersley Grove, Thundersley, Benfleet, Essex SS7 3EB, England. UK - £7. Europe - £7.50/€10. USA - £8/$15.00 (or equivalent) for the rest of World. Well-researched articles. While mostly on European labyrinths and mazes, also has articles on examples from all over the world. Relevant Books published by Thorsons and Harper. In Britain a good place to order books in cyberspace is Watkins Books. What makes Voyager software so nice is that you can adjust the horizon - an absolutely necessary part of geomantic work. Internet Astronomy Software Programs vary in cost, but the one I use is an iPhone App called SkyVoyager from Carina Software (from iTunes) £14.99 (about $25 as of January 2010) . I take it outside with me at night, and point it at the part of the heaven I'm looking at. It not only names the constellations and planets, but the satellites as well! Even if you include the cost of the iPhone, it's cheaper - and IMHO - better/more immediately useful for naked eye astronomy than most regular computer astronomical software. Tools to measure angle of elevation to the horizon.I use the Suunto PM-5/360 PC Clinometer. Made in Finland. I ordered mine in the US from Forestry Suppliers Inc., Box 8397, Jackson, Mississippi 39204, USA. They also has a leather case # 37011. This tool is designed for foresters to estimate the board footage of a tree. It is therefore not really set up for long-range elevation measurements - however it is the best pocket tool I have found yet.